I find that joy is always hidden in the unexpected, and it's the discovery of these gems (especially in the context of your job) that remind me that people and situations arise in life for a reason. 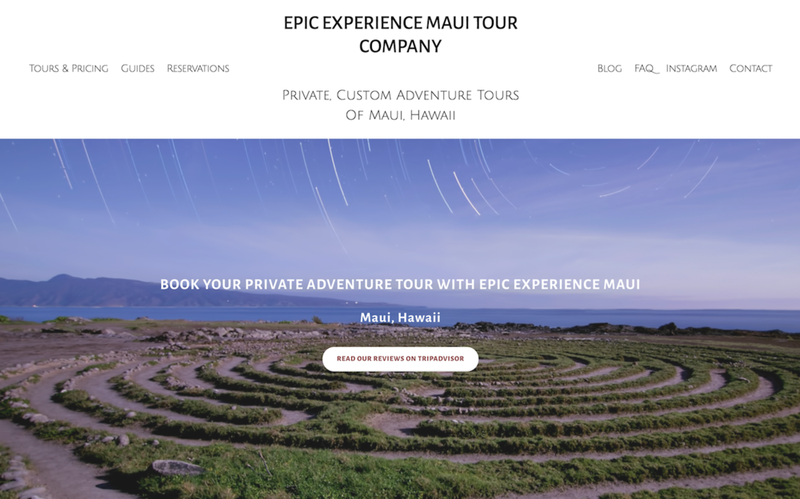 After finishing my last big project, the website design and development for Epic Experience Maui, I had a little time to reflect and I ultimately arrived at a place of overwhelming gratitude. Emily Machernis, the founder of Epic Experience Maui, is one of the most genuine, motivated, fun people I've ever met, and she was incredibly easy and uplifting to work with. She found me and Pueo Creations through social media connections and it was a "friends at first sight" type of thing. I miss working on this project, which is a rare feeling for me, and Emily and I have become good friends - both unexpected and invaluable surprises. I also would like to acknowledge the beautiful arial shots by Epicopter Arial Media Services and the incredible photography by Drew Sulock | Environmental Eyes that were used throughout the website. These images added infinite value to the finished product, many thanks to you both! However, a longwinded, heartfelt post is not (entirely) the purpose of this piece, so I'll give myself a word quota and get on with showing you the site. Simply put, I'm so proud of this website, I enjoyed each step of the project, and believe so much in this company! I encourage you to find joy in your work, let life surprise you with unexpected joy, and keep seeking inspiration in all forms!